What do you want to be when you grow up? Most children begin seriously thinking about what they would like to be when they grow up while still in their early teens. It is no different for a child with disabilities. However, children needing extra help and services find that once they graduate from the education system the programs and supports they need change or often disappear altogether. Given the changes currently occurring nationwide, it is imperative for parents to actively begin thinking about the transition process and what programs and services their child may need well before he/she graduates from the education system. By definition transition is, “the period of time during which something changes from one state or stage to another.” In this case, it’s the time when your child begins to prepare to move from the protected environment of the education system to an adult life. For most children with special needs the transition period begins at approximately age 14. Self-determination is a major key to the success of the transition period. It is vitally important your child’s dreams, wants, and wishes be taken into consideration along with his/her strengths and weaknesses. Discretion should be used to ensure the proper steps are being made at the right time, in the right place, and in the direction the child wants, and is able, to go. In most states transition services consist of a coordinated group of educational professionals focused on an individualized group of activities and services based on a child’s specific needs, abilities, strengths, and interests within the school system. 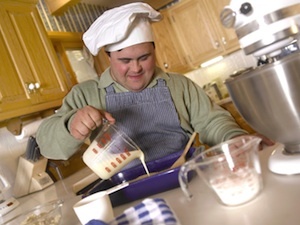 The purpose of these activities and services is to prepare your child for life after leaving the Individuals with Disabilities Education Act (IDEA) system by age 22. When it comes to life skills, this is where the rubber meets the road. This is the appropriate age when most children begin developing post-school living skills. IEP objectives should reflect the child’s individual needs concerning these skills. Cooking, cleaning, socialization, shopping, handling money and learning to use mass transportation are some of the myriad skills children in this age group begin to master. Remember those dreams and goals your child talked to you about when he/she was little? Now is the time to pull those out and look at them. Begin discussing strengths, wishes, and dreams with your child. What is realistic? Can your child’s dreams be accommodated into the more prosaic goals of learning living skills? Make a list of goals and aspirations that can be referred to and updated periodically as you and your child work through the transition process. Be sure to discuss your child’s aspirations with the IEP team and begin brainstorming ways to assist your child in reaching his/her goals to the best of his/her ability. Be realistic but do NOT count the child out! These are their dreams. It is vital for a child to develop self-determination skills while assisting him/her to reach his/her best potential. It is the job of the IEP Team and the child’s parents to assist the child in reaching these goals as far as he/she is able. Time to begin looking for programs that will allow your child to try new things and stretch his/her wings. Many children begin job sampling about now. This gives them a realistic idea of skills and talents they have, places they might like to work and jobs they might like to do in the future. As a parent/guardian, this is also the time to begin looking into school employment training programs, vocational programs, and community programs available locally. There are no guaranteed programs that will pick up where school leaves off, and it is up to the parent to seek out programs and services most appropriate for their child. It is also time to begin applying for state-based supports. Many states have waiting lists and you’ll need to get on those early in order to have services available when your child is ready. Look for available Vocational Rehabilitation programs in your area as well. Evaluate your child’s progress toward daily living goals. How is your child doing? What are his/her strengths and weaknesses? Is there anything that really stands out? This is a good time to begin job sampling. Look for a work situation that matches your child’s strengths and abilities, and, most importantly, one he/she would enjoy. Be sure to keep your child in the loop. This will help your child continue to build those self-determination skills mentioned earlier. Note for Parents: Now is the time to begin the legal guardianship and incapacitation process, if needed. Age 18 is considered the “age of majority” in most states. It is assumed that individuals will be able to make their own decisions regarding health, finances and their future by that time. They should be able to advocate for themselves, take care of bills and a bank account, decide where they will continue their educations and begin looking for ways to improve their independence. Many children this age are beginning to make plans to move away from home. Once your child reaches the age of majority (age 18 in most states) you will have no control over the financial, educational, or health related decisions your child may make. They become legally competent adults in the eyes of the law with all the rights and responsibilities of adulthood. Regardless of the individual’s level of disabling condition or functional abilities, that person is considered a legally competent adult until proven otherwise by a court of law. If your child’s decision-making capacity is severely affected or your child is unable to communicate based on a chronic or severe condition, it may be necessary for you to have a guardian appointed for him/her. It is important to begin this process BEFORE your child turns 18. It is much more difficult to obtain a Guardianship AFTER your child turns 18! Continue job sampling or even working if your child has found a work situation that really makes him/her happy. Many children this age have already found jobs that work well for them. Others will need to keep looking. Continue to evaluate goals and progress as you begin looking for post-school district education programs available in your area that match your child’s abilities and goals. At age 18, a person with disabilities will be eligible for Supplemental Security Income (SSI) and other assistance programs such as Medicaid. Once eligibility has been established, these programs will also allow your child eligibility for other programs within your community. Be sure to apply. Your child has the right to remain in school until age 22 (see IDEA 2004 Part B). Your child’s IEP plan can dictate whether or not your child should remain in the educational system beyond the age of 18. During these extra years he/she can focus on improving basic academic skills, daily living skills, further vocational and social skills, and gaining independence and self-determination. Children may want to graduate with their graduating classes and it is appropriate should they so choose. But they should receive a Certificate of Completion, not a diploma. If the student is awarded a diploma, they will NOT be allowed to return to the school system. To be the best advocate for your child, go out and visit the programs and community options available in your area. Use your best judgment in choosing or discarding programs you review. Be imaginative and creative in your evaluations. You are looking for a program that will most closely meet your child’s unique needs and circumstances. This should be accomplished BEFORE your child’s 21st year. This is also the time for you, the parent, to learn all you can about your area adult services for people with disabilities. Be sure that your child’s Critical Needs assessment, a Health and Human Services function in most states, is updated BEFORE age 22, and your child is on the waiting list for adult services. If you are unsure of your child’s status, contact his/her case manager or your Health and Human Services department for that information. One important note: just because your child leaves the school system does not guarantee he/she will be automatically accepted into adult services. Leaving the school system at age 22 will be a smooth transition if the proper steps are taken beforehand. Early planning and preparation will help parents and others provide a smooth transition from the school system to adulthood. Look out world, here they come! Linda is a self proclaimed “Old Mom” who has a 27-year-old daughter who, for the first seven years of her life, did not have a firm diagnosis. Her daughter was finally diagnosed just before her eighth birthday with “cerebral palsy – secondary to unknown etiology,” and more recently, “cerebral palsy with complications due to age.” Linda and the rest of her family, together, have worked with Easter Seals, University of Utah’s School of Architecture and Design and several other community and military family organizations across the state and Nationwide. You can find more from Linda at Special Needs Resource Project at www.snrproject.com. Let My Kid Go to School! What’s So Special About Special Education Meetings?